The topic has gained a lot of press lately with the announcement that Angelina Jolie had a preventative mastectomy because she has a rare gene that increases her risk of ovarian and breast cancer. I say good for her and I think we can all benefit from knowing what genes we are carrying and taking action to prevent them from being expressed. It's important to understand that just because you have a gene that increases your risk doesn't mean that it will. It has to be expressed or turned on first. What turns on various genes can be anything from environmental factors, physical and/or emotional stress and food/supplements you eat or don't eat. 23andme provides you with the raw data too which is a text file you can import into various applications that will provide you with more detailed reports. Some of these applications have a small fee and others are available for free. I did this test for the methylation genes which are important for detoxification, immune function, mood and just general health. Without a good functioning methylation pathway, you are at high risk for getting very sick. Knowing which genes you have in this methylation pathway can help you avoid health issues. If you already have health issues it becomes an important tool in figuring out what genes may be turned on and causing them. Below are a couple of good apps I would recommend that pulls the methylation and other genes from your raw data and some provide health reports. Genetic Genie - free and includes 31 genes related to methylation. See a sample report. MTHFRsupport - $20 and includes genes related to methylation, allergies, mitochondrial, thyroid, detox, clotting and more. You can also contact them and they will go over the report with you and tell you what each gene's function is in more detail. If you don't want to pay for a consultation, another option is listening to this BlogTalkRadio interview where they go over many of them in detail. See a sample report. Promethease - For $5 offers a variety of health information based on your 23andme results. See a sample report. Unfortunately this method of treatment and disease prevention, called epigenetics or nutrigenomics, is still very new so if you were to take one of these reports to your doctor they may not know what to do with it. An ND or Functional Medicine doctor are your best bets. Search online for someone in your area and call around to doctor's offices to see if they are familiar with 23andme and methylation. There is a list of knowledgeable doctors on mthfrsupport that continues to grow. If there's no one in your area there are some that also do phone consultations which is what I'm currently doing in addition to working with my ND. I posted my methylation results before in a different blog post here. It is interesting to see how my lab test results I had done correlate with the genes I have. For example, one of the genes in the MTHFRsupport report is CTH S4031I (rs1021737 from 23andme) and this gene produces an enzyme that converts Cystathionine to Cysteine. In the Metametrix ION profile I had done it showed my Cystathionine level was very high which makes sense because I am +/+ in that gene. B6 is the supplement that aids in that conversion process so that should help lower my cystathionine and get things moving in the right direction. I found several instances in lab testing that confirmed that several of my genes are being expressed (turned on) which has helped in identifying what supplements I need to take to improve my health. 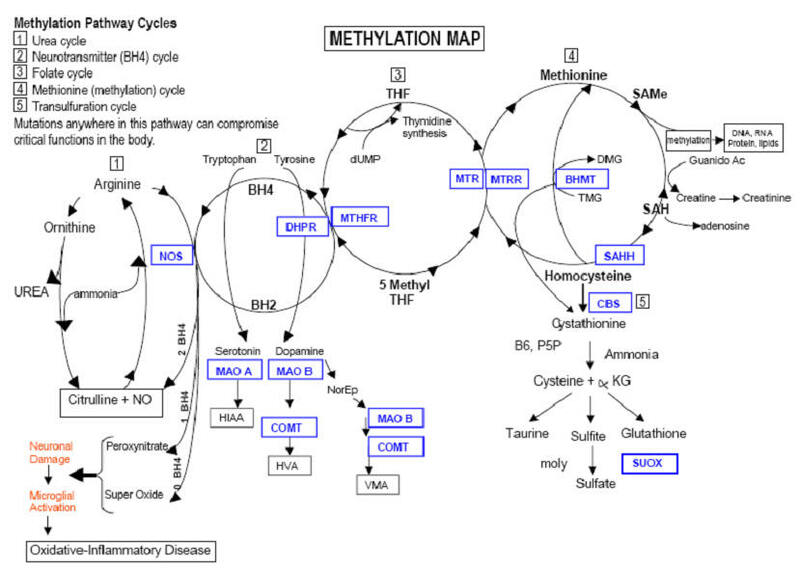 This is a handy methylation map that shows many of the genes in the cycle. There are a lot of different diagrams out there but I found this one the most helpful. The blue boxes are the methylation genes. I'm not familiar with SAHH and DHPR. I haven't come across those in any of the research I've done so not sure what their role is. I highlighted the ones that I have on a printout and brought the diagram to my ND to show her because she wasn't very familiar with it. In this map I have BHMT, MTRR, CBS, MTHFR, MAOA and COMT. I think I probably have a little more than most people. There are other genes involved besides these but these seem to be the most important ones. 1st priority: ACAT, SHMT and CBS. Note that ACAT and SHMT are not pictured in the diagram. They are related to gut disbiosis and imbalanced flora and CBS can cause an upregulation of homocysteine, creating toxic levels of ammonia and sulfites. 2nd priority: COMT, MTR, MTRR, MTHFR, NOS and SUOX. AHCY, BHMT and PEMT have also recently been added as 2nd priority mutations. BHMT is the methylation shortcut so if you have MTR and/or MTRR mutations BHMT should be supported first to get the cycle going. This is done with supplementing with TMG as noted in the diagram. This is the step I'm currently at because I have 4 of the 6 MTRR mutations. Eventually I'll be able to start supporting the other 2nd priority mutations with active forms of folate and B12. Other: SUOX, MAO A, NOS, ACE, PEMT. I have MAO A which breaks down serotonin. They call it the warrior gene because it can cause aggression, violation and antisocial behaviors. I also have PEMT which can cause problems converting phosphatidylethanolamine to phosphatidylcholine so am taking sunflower lecithin which contains high levels of choline. I have already noticed since taking it that I am able to remember my dreams easier than I used to. You can learn more about each of these mutations in Chapter 6 of Dr. Amy Yasko's Autism Pathways to Recovery e-book. Well it turns out that I have 8 homozygous mutations in my methylation pathway. I also have 4 homozygous and 4 heterozygous mutations in my detox pathway. This is not good......this is not good. I have a similar issue as you- CBS homozygous, MTHFR, MTRR, BHMT, Maoa,VDR. I just got my results and I'm overwhelmed. I am scared that the CBS issue will keep me from really getting my methylation process going well. Have you found that you are doing better since addressing CBS? I tried to start address just the methylation with methylguard and I got really sick. Just wondering how your process is going. How did you decide that the risk of further compromising your gut immune system from taking an antibiotic was worth the risk to help the methylation pathway? I know I have gut issues (probably parasite) by my ND seems to be concerned that I don't have adequate nutrient storage/immune strength to handle killing any bugs with drugs. I think he wants to focus on the low sulfur diet and the shortcut cycle. I'm confused if I should go ahead and do the gut repair without having adequate systemic support. This is so hard to know which steps to take first!!! I didn't really decide, I am seeing a methylation expert from mthfrsupport.com and they suggested the antibiotics. Sure there are options to get rid of the H Pylori without antibiotics but they seemed to take a long time and may or may not work. Even the antibiotic treatment method is pretty harsh. It required me to take 3 different antibiotics because it's so hard to get rid of. I agreed with him that this would be the best and quickest option for me. I'm taking lots of probiotics to rebuild my good gut bacteria. So you haven't done any gi tests yet? Seems like you should at least find out what you have if anything. If you have candida it can be treated easily while you are working on CBS/Shortcut. There are a lot of natural antifungals to help with that. I spent a long time getting rid of mine. sorry to keep bugging ya but I'm happy to find someone with similar issues. I have done GI tests in the past, and have tried treating parasite issues several times but still feel symptoms. I haven't had a test in the past year, I should repeat. I've been on the GAPS diet for 7 months. That's how I learned I couldn't methylate- it made me so sick because it's a high sulfur diet (similar to Paleo) and it lead me to all of this new DNA info. Yasco recommends dealing the the CBS/short cycle 1st, the long cycle/gut issues it seems but I am wanting to hear why the gut issues are a priority with other practitioners. I'll try to get support from mthfrsupport.com I think for a second opinion. Have you improved much since starting the CBS/shortcut protocal? Are you doing the low sulfur diet diet? I've done about 2 months of a low sulfur Paleo diet (no grains) and I hate it, but am trying to address my gut issues with diet. My blog is www.lifewithspirit.wordpress.com You can read more about my health journey. My daughter had an autistic spectrum issue that really got me going with this whole GAPS diet, methylation issue. The reason it's suggested to treat gi first or at least along with the CBS/shortcut is because many people have leaky gut, inflammation, etc and the supplements and nutrients you take are not absorbed very well until your gut is cleaned up so it's like a waste of money to buy and take all these supplements because they aren't getting absorbed. Yes, I'm doing low sulfur and also taking molybdenum and yucca root. Are you taking those to help with high sulfur and ammonia? I've been on a whole foods type diet for a couple of years now but just started looking into this methylation thing at the beginning of this year. I still eat some grains but very minimal. Mostly brown rice and quinoa. It's awesome that your daughter is doing better with the diet change. ok thanks for the info. I'll keep you updated. I will add Yucca to my list. And I am sure the leaky gut thing is still an issue. It is so hard to "fix". I have the healthiest diet, taking probiotics, fermented foods, etc but I know absorption is still an issue. Do you take the yucca root caps? And do you eat meat? I read that too much meat will make the ammonia worse. However meat is one of the few sources of nutrients I get on this GAPS diet. Also do you eat low free thiol sulfur foods or just low sulfur foods, there are so many conflicting lists of what type of sulfur foods you should avoid. Do you eat chia seeds and flax seeds? Those are good for leaky gut. I put a tbsp of chia seeds in my shake every morning. ghee is also good. Yes I eat a good amount of meat (organic and grass fed). I do the low thiol diet. I use the NOW brand Yucca and take one with each meal. ps. thx for the key lime pie recipe :) Looks great! what kind of shake? I always need a breakfast idea. This diet is so limiting. You don't find that the meat causes too much ammonia? Maybe its the yucca root you take I guess that helps? Always do 2 tsp ghee, 1-2 tbsp coconut oil, 1 scoop of BioInflammatory Plus Powder, 1 tbsp chia seeds, 1g ascorbic acid, water or almond/rice milk and then I add a little fruit & veg like pear, apple, berries, cucumber, kale, spinach, parsley, celery, carrots or squash depending on what I happen to have. I was avoiding all fruits for a while but after my candida cleared up I started having some in my shakes. and yeah, the yucca root helps with ammonia.